WORMWOOD TRAVELS TO THE PROMISED LAND OF WACKEN! At last one of the Worm-crew has made it to the Holy Land. 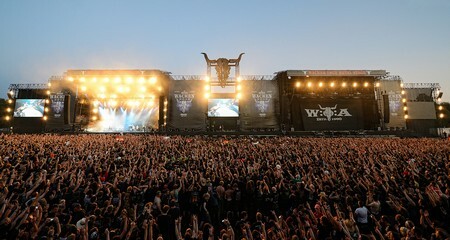 It took nothing less than a chance to review the world's greatest heavy metal festival to get our old friend THRASH-HEAD out of retirement, but Thrash took the bait and made his way to Germany and the small town of Wacken to behold the ultimate metal spectacle. He delivers this thorough report of every day of the event, including performances by SAVATAGE, JUDAS PRIEST, OBITUARY, UDO and more. In the end, he could barely work up enough willpower to leave the festival grounds and come back to the boring USA! You can read his report and see photos from the event right HERE! Add LEE DORRIAN to the list of interviews upcoming here. Lee is well known for being a member of CATHEDRAL and NAPALM DEATH, but now hangs his hat in a killer new band called WITH THE DEAD, featuring former members of ELECTRIC WIZARD! Look for that down the road. OCTOPI MILLS tells me he's grabbed a chat with chilling folk-metal disciple PETRICHORUS as well! A rather gloomy collection of names inhabits this week's Torture Chamber...open the door and see for yourself! CATTLE DECAPITATION "The Anthropocene Extinction"
WITCHSORROW "No Light, Only Fire"
DOGBANE "When Karma Comes Calling"